Boy, am I out of practice! 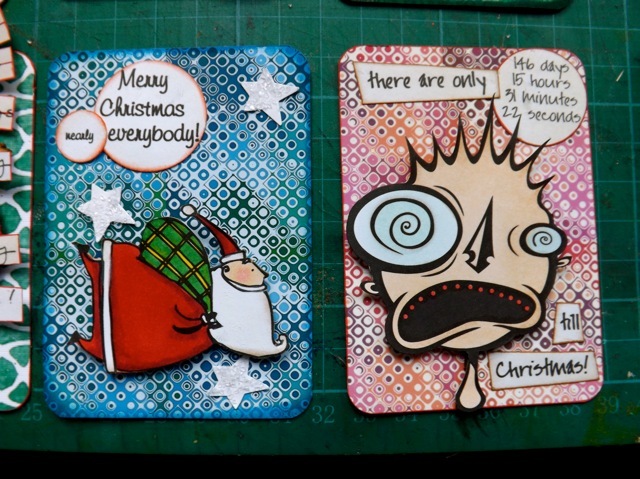 But I managed to finish my ATCs so I am happy. And I not only used and old tool that I thought was only fit for the bin (the Creative Palette) but I used something I bought and had not used yet. It is a little stamp set from Tiger that cost me all of £3 and is so useful. Doubly so since I bought two, recognizing that it would be useful to have multiples of letters and more than one upper case set. You can see it comes with both a circle and a flat piece. What I love is that the flat piece can be arranged either in a long strip of in two or more lines. I may even get a third set to extend the amount of typesetting I can do. To be fair, the font is dead simple, not anything to add any real style, and since I stamped the text then cut it out, printing the text would have worked as well. But had I decided to stamp directly onto the background I could have. You can see I added a few little resin dots here and there. I actually really like them! And it got me doing SOMETHING creative so for that it is all good. Now off to help clear the dining room and hubby’s office – having one hardwood floor sanded and oiled, and a new wood floor added to make hubby’s home office warmer in winter. The cold air actually BLOWING up from below the floor made working in there a challenge. Also, dearest son will be visiting from tomorrow, as he breezes thru Europe on his way back to LA. So I may be otherwise occupied and back to not crafting for a few more days. Oh well, it was fun and I’m sure I’ll get back to it soon…. 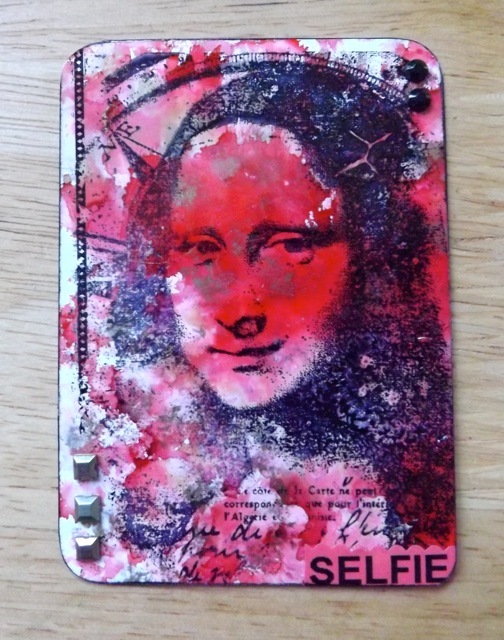 Categories: art, ATCs, stamping | Tags: art techniques, ATCs, stamps | Permalink. Finally, a use for the Creative Palette! It has been far too long since I felt up to any crafting but knitting. I am finally feeling a bit better and trying to flex my creative wings once again. 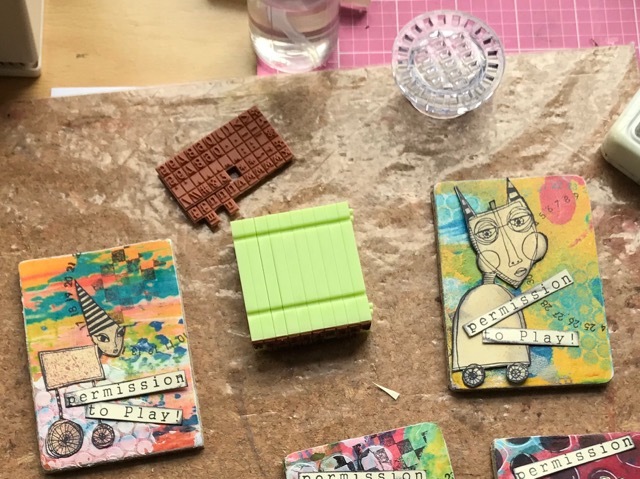 I am taking a free class from Carolyn Dube called Permission to Play (link in the sidebar) because I used to take part in her Gelli Print Party and I like her enthusiasm and her style. 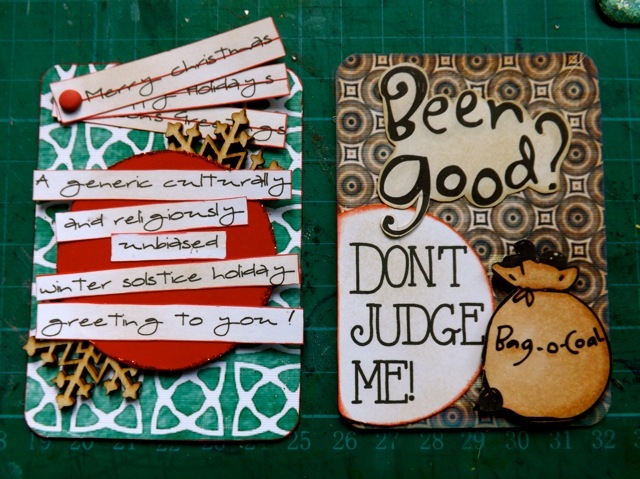 I am not quite ready to jump in fully as I am very much out of practice, but a post in her group showed some fab ATCs. 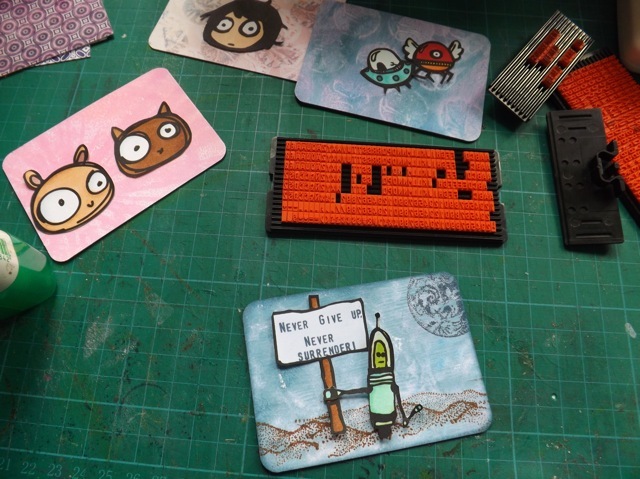 I remember that whenever I felt like I needed a little jumpstart, making ATCs usually worked a treat. Little bite-sized pieces of creativity, very manageable, and using nothing too precious. 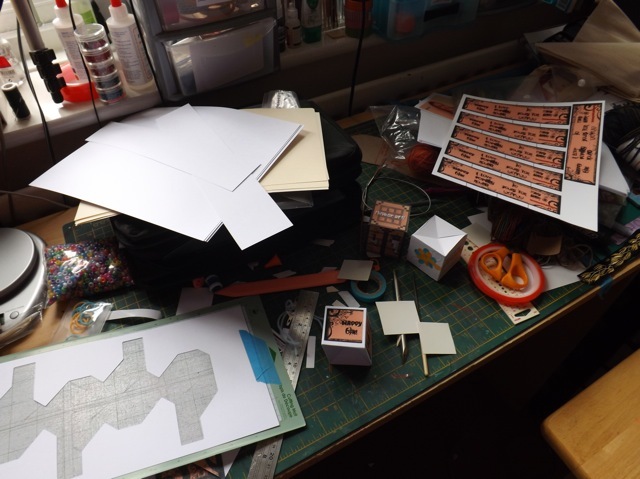 I collected up some stuff – I wanted to make use of the prompt (Using Cardboard or Trash) so I started by covering some cardboard with bits of the Sparks of Art-spiration Carolyn includes as an endless resource – mess it up? print another! I also dragged out a sheet of Teesha Moore stamps that I had not yet even cut from the sheet. And cut them. I think I may have mentioned about 100 times how much I loathe mounting stamps. I was not sure I had that sticky backed mounting stuff so I wasn’t sure how best to deal with them. 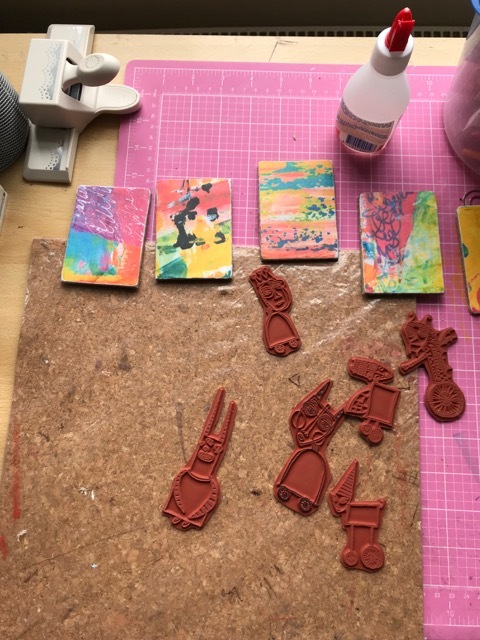 I considered using sticky backed fun foam, which I have done before and which works pretty well, but what had been in my head was the crappy Creative Palette pseudo-Gelli plate that I reviewed in the past. 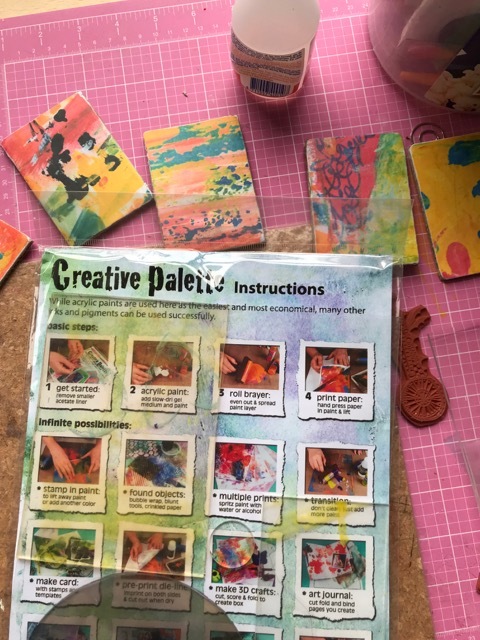 Carolyn also has a video on using the Gelli plate to pick up the overflow from acrylic pours and when dry, use them as skins to add to your art. I saw that a day or so ago and thought that THAT might be a good use for the CP. It has languished in a drawer for YEARS and I hate to waste money so I’ve held on to it, SURE I would find a use for it SOMEDAY.) It was something I was already thinking about. A solution presented itself. 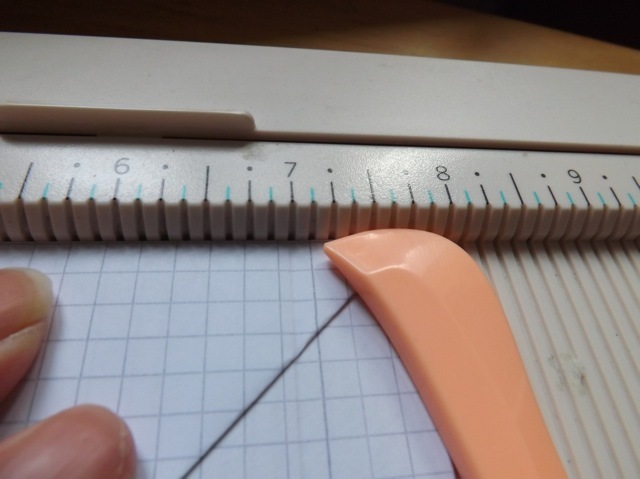 One problem with the CP is that is is really sticky, for Gelli plate-style pulling. and I pressed the unmounted stamp into the plate. 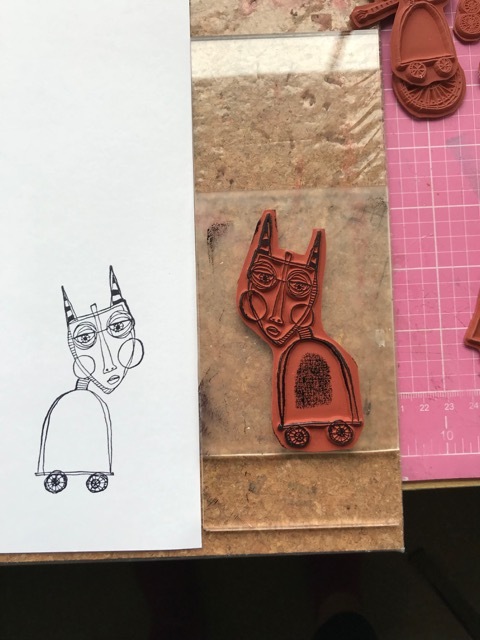 The first time I tried it the stamp fell off – it doesn’t grab the rubber supper firmly with just finger pressure, but if you are ready to stamp and you tamp the ink onto the stamp with a bit of pressure, it will hold. And it’s a pretty sharp image, right? So this makes me very happy! 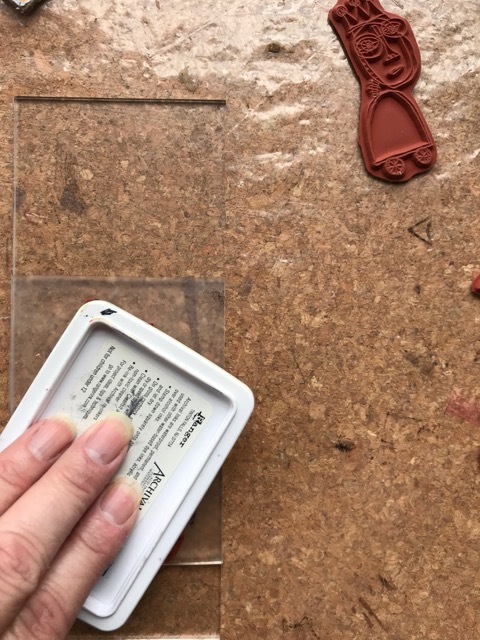 It means I can pretty closely trim the rubber around the stamp without stressing that I have undercut the image, I can cut close enough that I can see where the image will be placed, and I don’t need to buy sheet after sheet of mounting foam! RESULT! Now, word of warning. If you try this, I would shake the mount and make sure the stamp is firmly attached before inking. 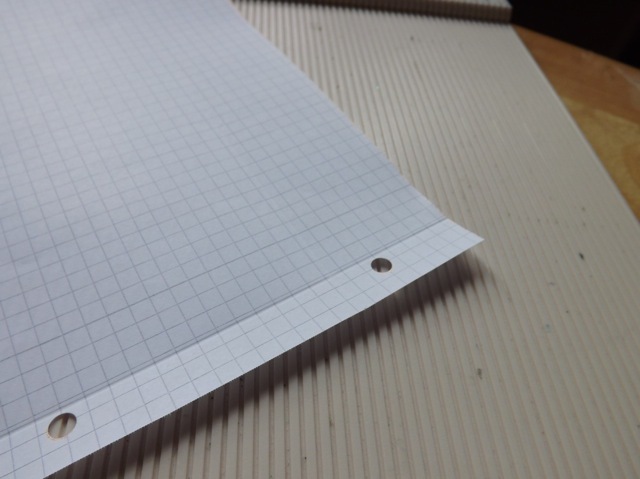 It is a temporary hold, strong right after you have pressed the stamp into it and strongest after you have really pushed it down with the inkpad. It will eventually loosen and you might have the stamp fall off onto your project if you dally. Washing the CP (like you do with cling stamps) to refresh the sticky will help. I guess it depends on your tolerance for error, and need for perfection. For me, as I am not placing the images but will cut them out, it’s a great solution. Sorry for the portrait style photos – after I decided to post it I realized my camera batteries were dead, the charger MIA and that my phone was downstairs. My iPad was near so I used that for the photos. Next time I’ll rotate it 90 degrees so the post isn’t so long. It’s like I have to learn how to blog all over again… DOH! WOYWW time again. Feels like I just returned all my visits oh wait, that’s cause I did! Ah me. Now all the excitement over the anniversary is over, real life once again asserts itself. 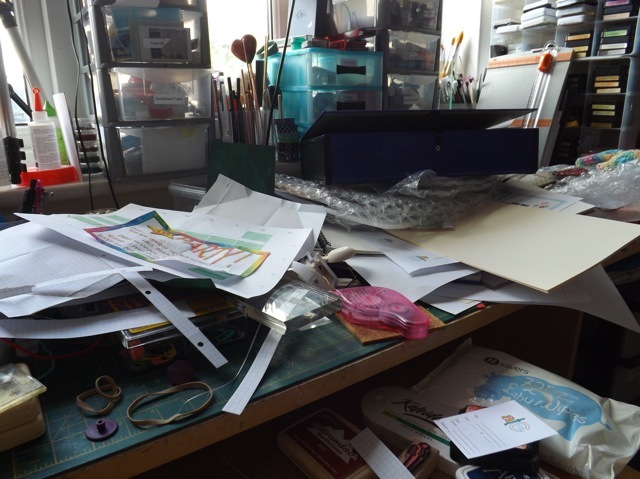 My desk is full of accounts paperwork (ugh) and my art journal, dragged out to share with DS and his GF. She’s been thru most of the scrapbooks and some of the DVDs of DS as a baby, so we are moving on to more crafty things. 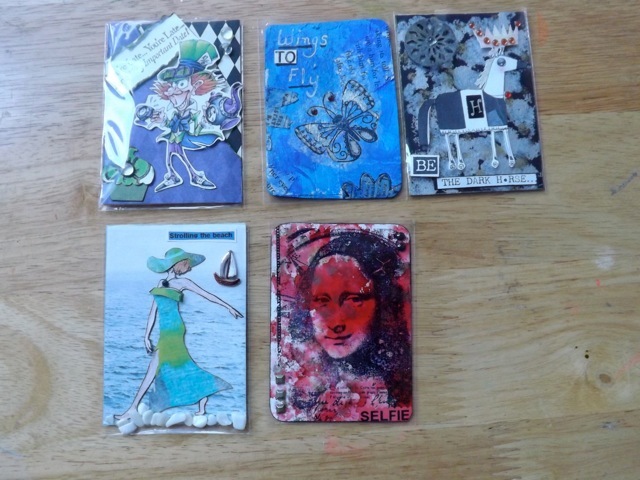 I did manage to get all the ATCs for the anniversary swap into one ATC holder. Apologies for the crappy photo, but I didn’t know my batteries were dying, and there was a bit of a power issue in the area so we shut everything off for a few hours and I couldn’t re-charge them before snapping the photo to schedule. When the batteries are close to giving up the ghost, my camera will only take blurry shots. Such a lovely variety in style and colour, and yet I absolutely adore every one of them. Each one is a little bit from a friend to inspire me. I did manage to get the inside of DS’s computer clean. Ready for a scare? Bear in mind that is two A4 sheets, the flyer. 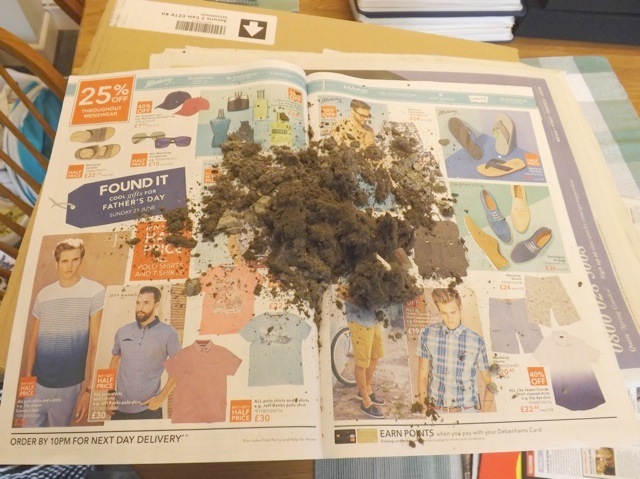 That gives you some idea of exactly how much dust I removed. Blocked fans are no laughing matter, and overheating is not good for a computer. I didn’t measure it but I am going to say it was over a 1/4 cup of dust. And still working my way thru piles of laundry, only 4 more loads to go…maybe 5 …. then it’ll be regular laundry day again. 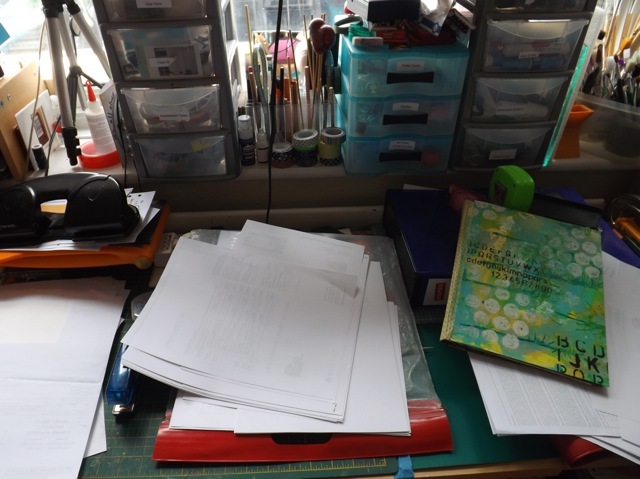 Lucky the washer and dryer are close enough to my desk I can multi-task – put in a load, visit a desk or two, switch to the dryer, desk hop some more, hang our a few things, more desks…. Categories: ATC display, ATCs, WOYWW | Tags: ATCs, WOYWW | Permalink. So I just had to work it out. And I obviously can’t keep it to myself till next year’s ATC swap, so although this has a WOYWW theme, it is easily adaptable for other sorts of swaps. 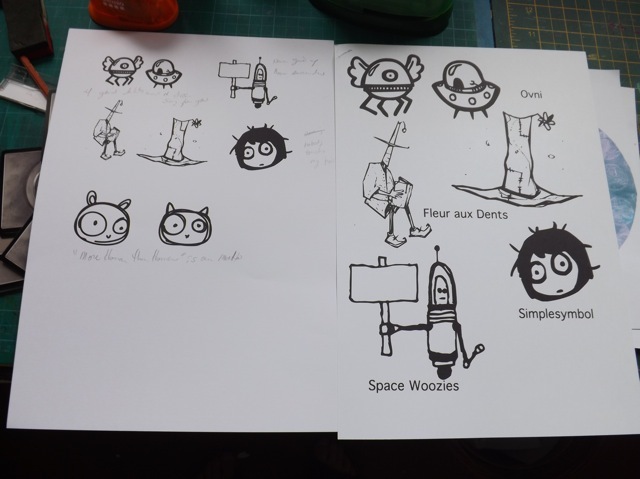 I may take the time to work up a printable, more generic version others could use for their own swaps, at some point. I am loving my monster monitor, btw. 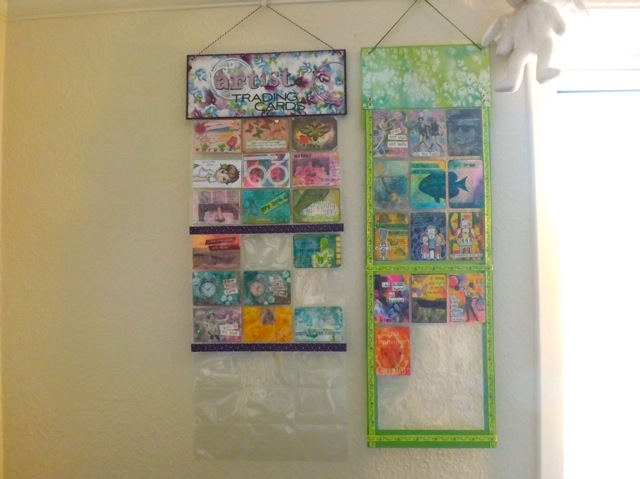 Categories: ATCs | Tags: ATCs, origami | Permalink. 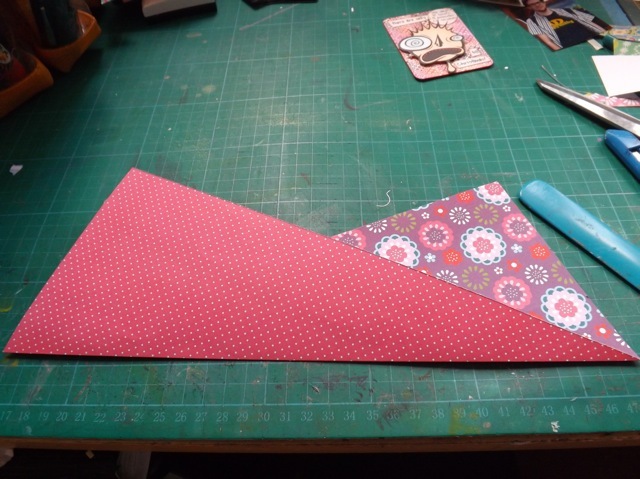 It’s a folder, it’s an ATC…it’s and ATC folder! LOL! Funny how this one came about. 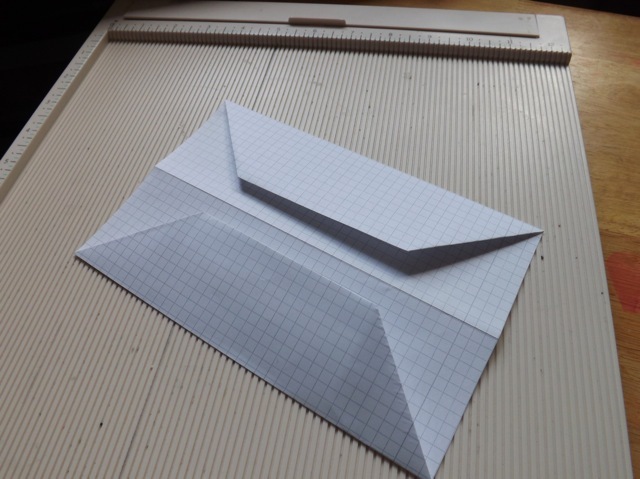 An email asking about an origami folder. I think I actually made one of these before but it’s been AGES and I had totally forgotten about it. One of my followers was working on something that used a variation of this as a base. She wanted my opinion on one element, which I gave, and I think sorted out the problem she was having. But in order to do that, I had to make one again, to see how it worked. 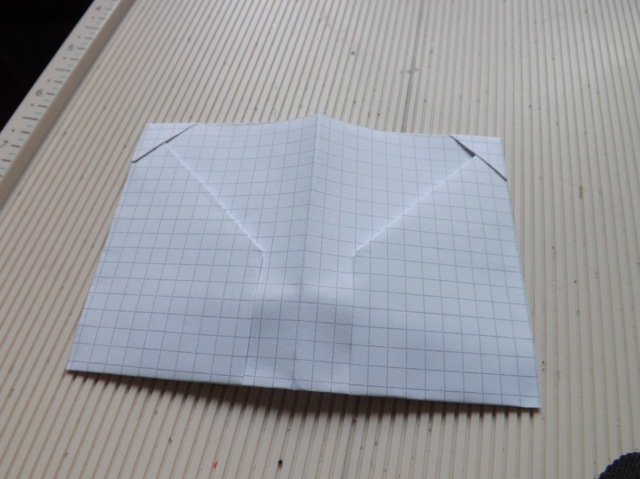 It’s a fairly well-known origami fold, but making it gave me an idea. 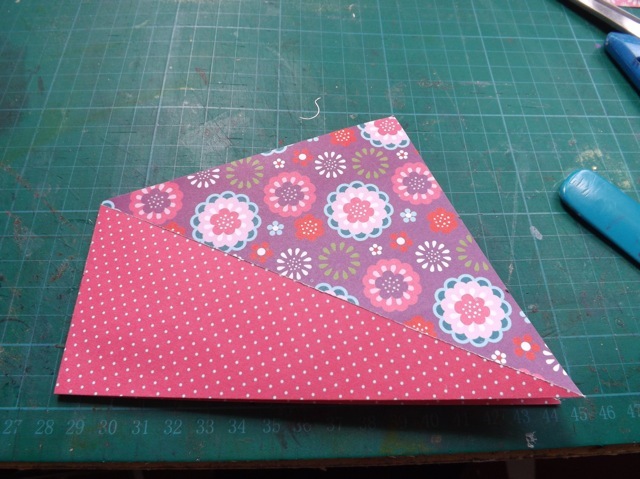 I thought it wouldn’t be too difficult to make one that was ATC size, to use as either an actual ATC or as a folder/mailer for an ATC. 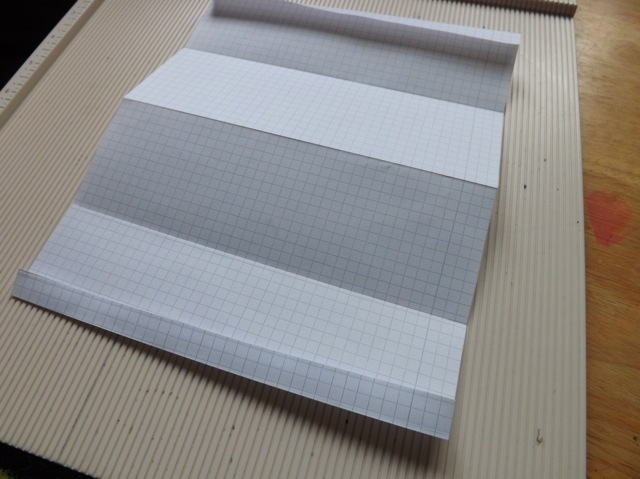 The trick is the size of the paper and where to make the folds. Mine ended up about 7 3/4 inches, but so long as the essential fold falls at 7 inches, it’s fine. I’ll reference it when it comes up later. 4. 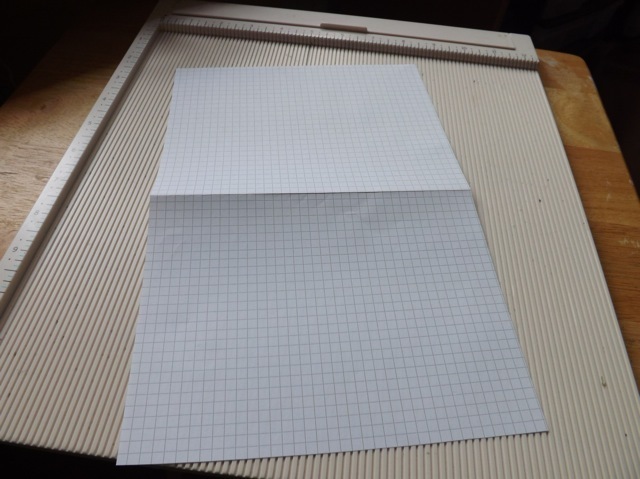 Open the sheet and crease and fold 1/2 inch down at the top and bottom edge, towards the centre mountain fold. then fold in. Again, the mountain fold is facing you. 6. Flip over, and score one end at 7 inches. 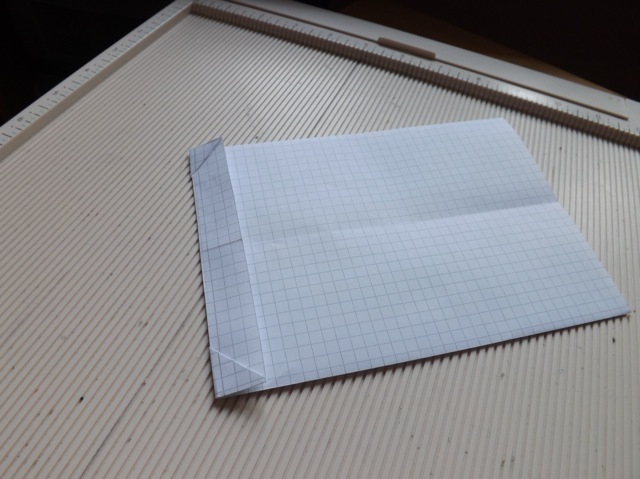 This is where the width of the paper might make the size of the folded edge differ. Mine is only 3/4 inch because my sheet couldn’t be 8 inches once I cut off the holes. 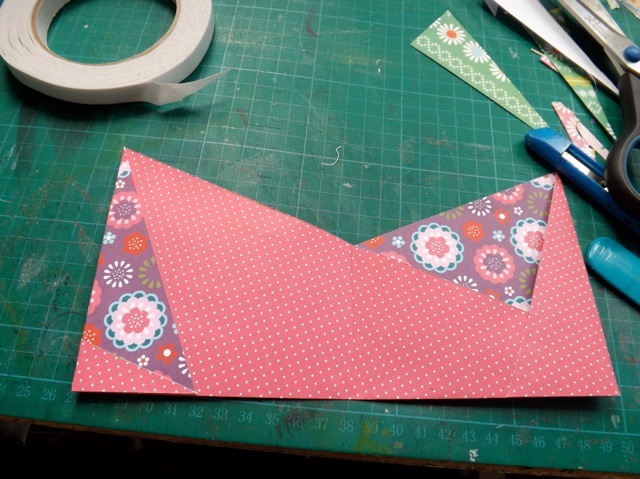 and fold along the centre crease to close and create a 2 1/2 x 3 1/2 folder! 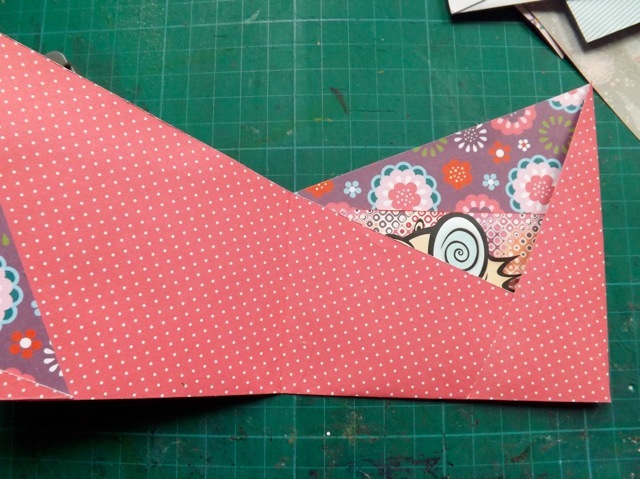 You now have a folder that can BE an ATC, HOLD and ATC, or just be a cute little folder for anything. 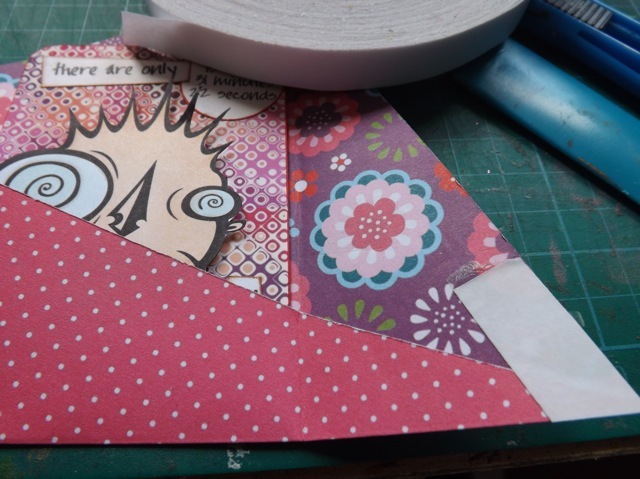 Kinda sorry I have already made most of my ATCs for the WOYWW swap, and they are too thick to fit inside this, but I have another idea to play with that I might keep in my back pocket for another swap sometime…. I’m not mentioning the follower only because she told me what her plan is for her version and she might not want that. If she wants to, she can comment with a link or more info. I have the best followers. One of them, Diana, lives in Oregon. She commented on my WOYWW crop ATC and asked about a swap, so we arranged it. I actually got these a couple of weeks back, but hadn’t shared them. I really don’t do a lot of ATCs. 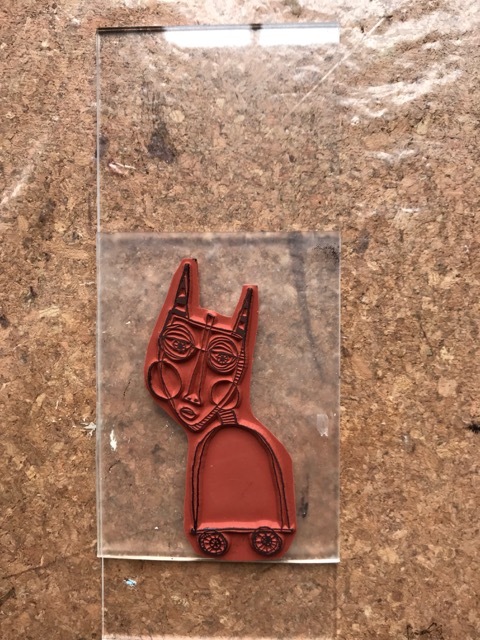 Sometimes when I just crave doing something crafty but life is hectic (like it seems to be nowadays) I’ll carve out a little time and make a couple. I told her I don’t have but a few and picked out what I hoped was a nice one for her. 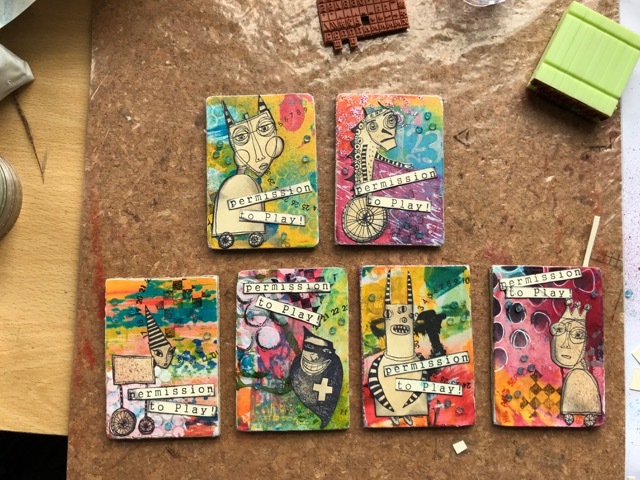 She, on the other hand, went over and above, sending me not one but a whole pile of ATCs. Had I know I would have made more! Isn’t The Dark Horse cute? And the Mad Hatter? And don’t you love the pretty butterfly (the photo doesn’t do it justice) and the real shell pieces on the “beach”? I should have taken off the little plastic protectors. I did with this one, perhaps my favourite. I love the look of it and the title – perfect. I guess I have ATCs on my mind, as I am prepping a pile of them so I can have a productive day on Saturday. I want to go to the WOYWW crop with a stockpile of swap ATCs cause there are always on-the-fly swaps arranged there, as well as people from far flung places who send ATCs you might not be expecting, that say they aren’t expecting a swapsie. But I want to be ready with one to drop in the envelope. Categories: ATCs | Tags: ATCs | Permalink. 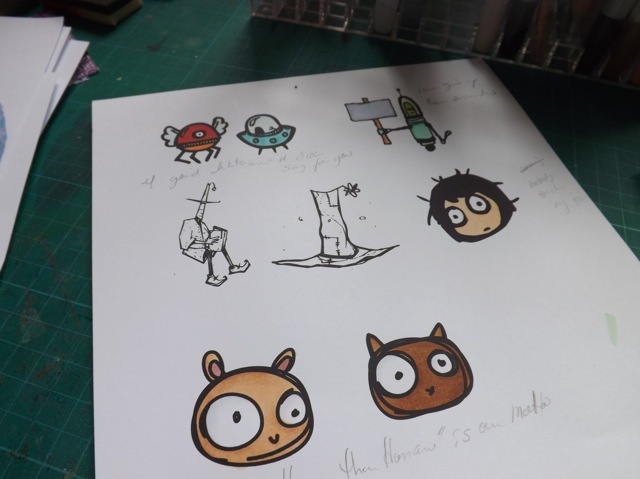 Getting close now to the WOYWW 6th anniversary and as usual my mind turns towards the ATC for the swap and something to make for the crop, like the little pointy eared fellows from last year. This time I wanted to have something that I could mail, and I think I cracked it. 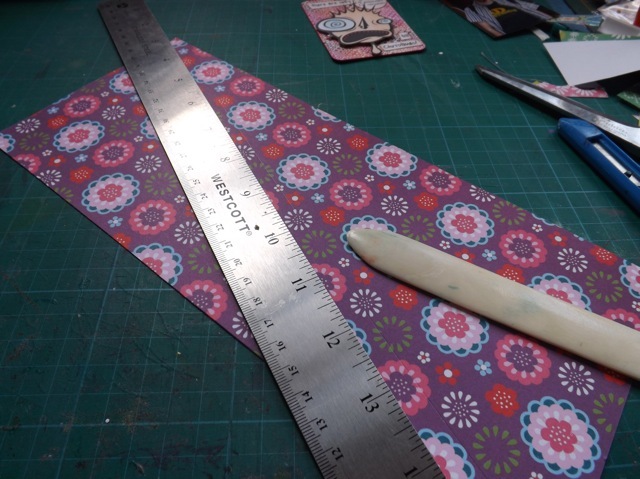 The Cricut mat on the left has the template, created and sized for the ATC I have in mind. I did in using a combination of an online” gift-card” download, my Intaglio drawing program, my Cricut with SCAL and a LOT of trial and error. I even found a use for the bajillion loom bands that litter the floor in every room of my house. DD is still hopelessly addicted to making them. I have a couple of experimental versions – and no, clicking the photo won’t make it bigger so you can get a better look!- some easier than others, but I am limited by the tools I own. There is no way I am going to be able to make more than a handful. I have the structure of the ATC already sorted bit the design of it is a different matter. 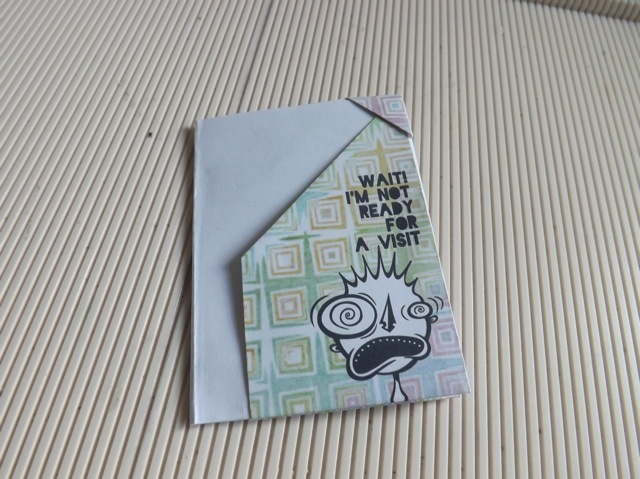 I am loving my ATC displays and already thinking I need to make one specifically for the 6th. Have a happy WOYWW day. See you round at yours in a bit. So I was looking at the Twisted card from yesterday, and as I still had some of the ATCs from last week’s play on my desk, it occurred to me that the card, with a little change, could work well for an ATC holder. When we did the WOYWW swap of ATCs I seemed to get either just the ATC, in a plastic sleeve, in an envelope, OR I got the ATC in a card that looked like it took as long to make as the ATC did! 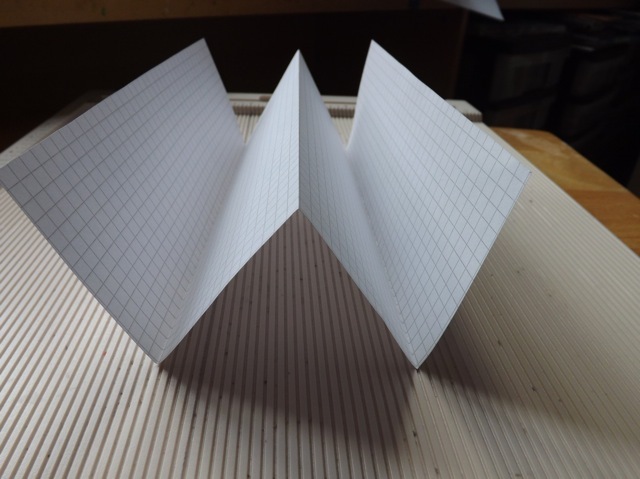 I thought that old, unloved double-sided papers could be used to make a twisted card, starting with a slightly wider strip, and used as both protector and card. I don’t doubt some people would still put the ATC in a plastic sleeve, but they would still fit. 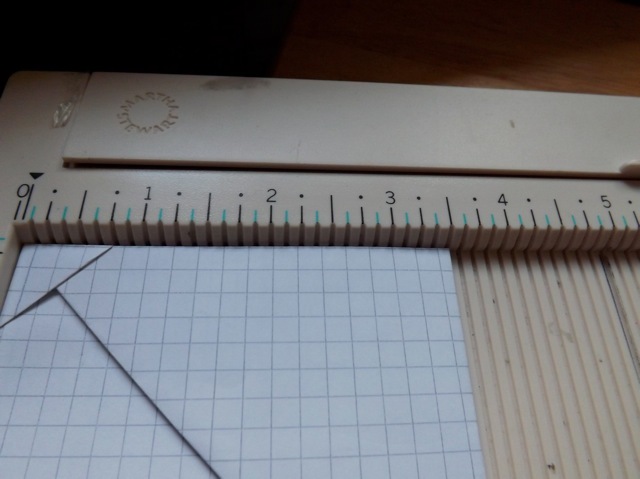 The only change to the cutting is to start with a 5 inch wide strip – I used the A4 papers from the pack, but I am fairly sure a US letter sized sheet will work fine. 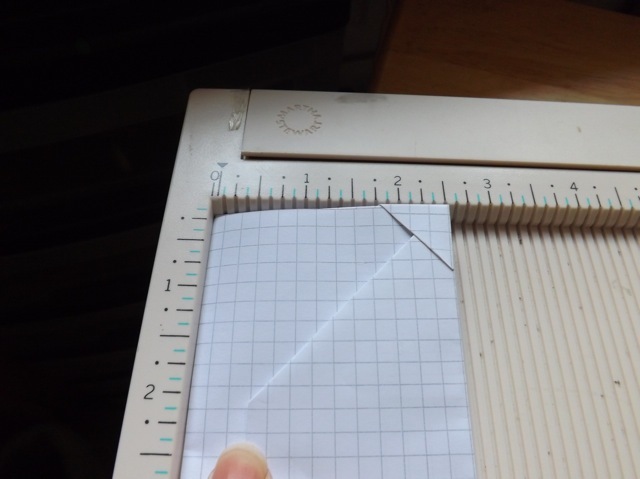 Try it with scrap paper and see. 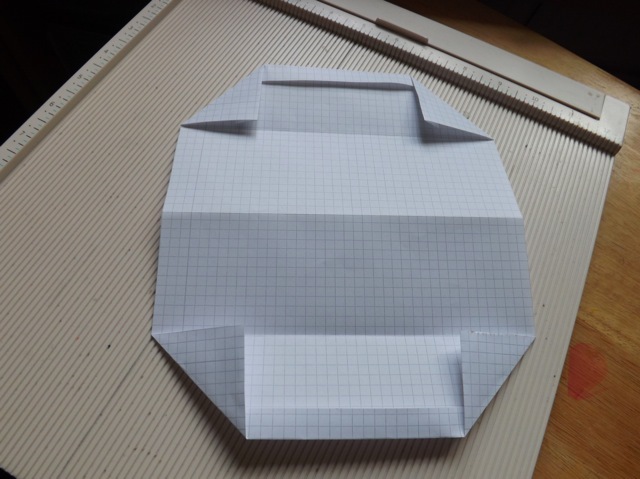 Using double-sided paper means no other decoration is needed, really. 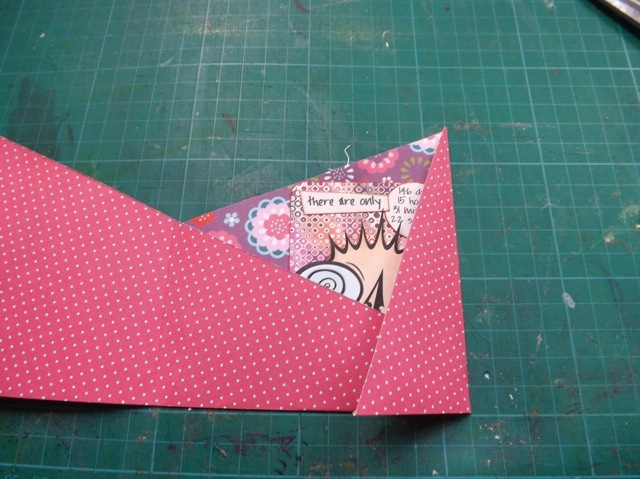 Fold in half to create the card. and that pocket, when folded, works for portrait or landscape. Gee, you can really tell some of those photos were taken last night and a couple this morning! Amazing the difference in colour. 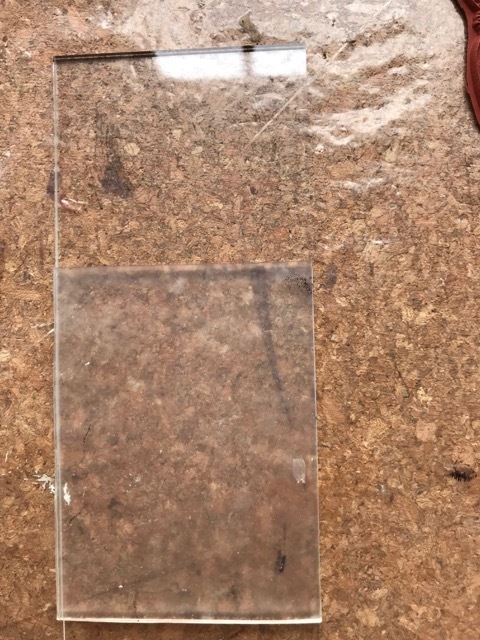 Anyway, I also ran a thin line of adhesive in the middle near the fold to secure it all nicely. 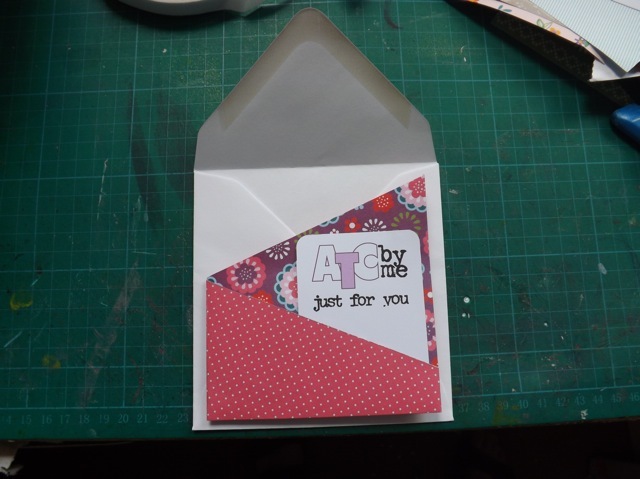 And still, the card with ATC enclosed fits nicely in a 5 1/4 inch square envelope. I also wouldn’t discount this variation on the twisted card as a card in it’s own right. 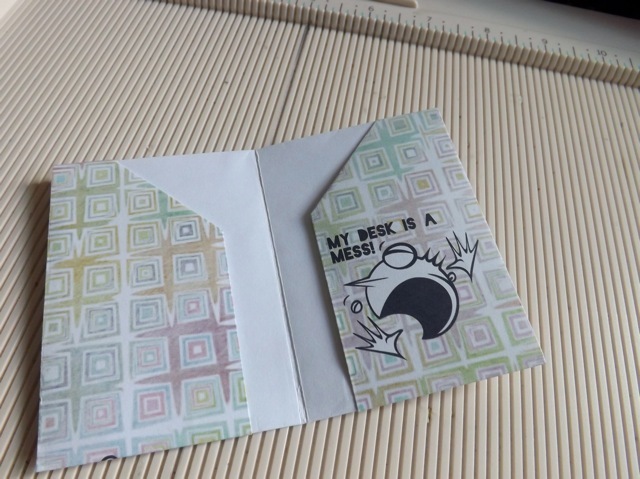 With the right double-sided papers it only needs the bare minimum to decorate it, it is sturdy enough to stand up, can hold a gift card or photos and is easy enough for a kid to make. I just love it when a plan comes together…. 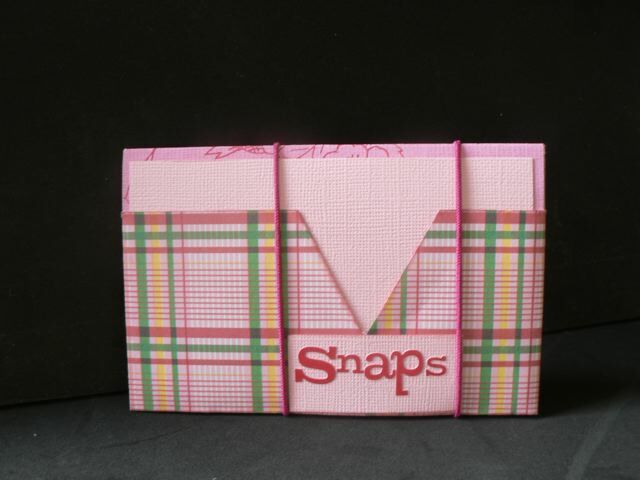 Categories: ATCs, cards | Tags: ATCs, cards | Permalink. 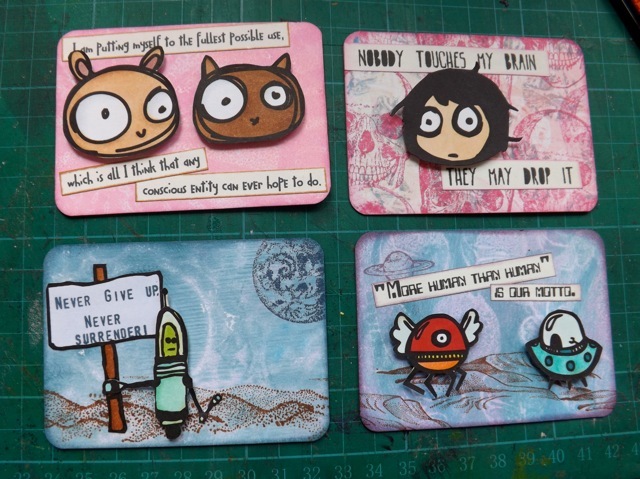 I also wanted to make use of the prints from the Creative Palette – they weren’t brilliant but they worked OK for what I had in mind, a small set of ATCs with some favourite sci-fi movie quotes. So they formed the backgrounds, with a bit of stamping and printed text. Well, except for this one. I seem to have a few of the office supply, tiny text create-a-stamp sets and I decided to give them a go. They actually worked pretty well, although placement is a bit tricky. So, how many can you identify, without checking Google? I am putting myself to the fullest possible use, which is all I think any conscious entity can ever hope to do. Nobody touches my brain. They may drop it. “More Human than Human” is our motto. Rushing now, as DD has an eye dr. appt. in an hour so better get moving! Eeek! time slipped away from me today…. 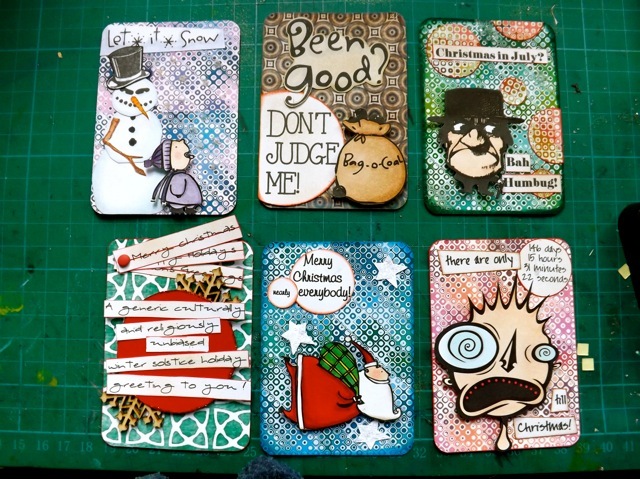 It’s a bit of a pet peeve of mine, having ATCs with stuff hanging outside what will fit in the sleeves so the strip of considered and rejected Christmas greetings are meant to collapse. And I really like these two in particular – I checked the official Christmas Countdown online to get the exact timing between NOW and CHRISTMAS for the circle. It really is QUITE a long time away…. The Santa is another of the 2Peas font (and I see you can download it for free from here now so perhaps other 2Peas freebies are still out there to be found) and the screaming man still unknown. If I ever get the info on that old image bundle I bought I’ll let you know. 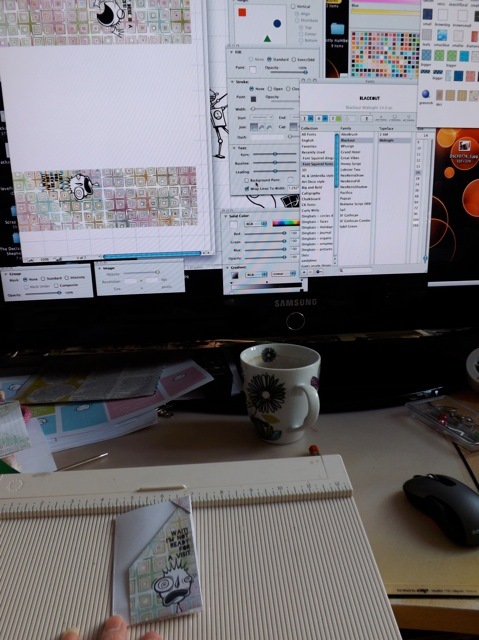 In general I do think I demonstrated that printables CAN be used quite nicely in other ways, not just for Project Life, or indeed just for scrapbooking.